Washington, D.C. – Geoscientists from across the nation visited Capitol Hill to share their research and voice their concern over fizzling federal support for earth sciences with policy makers from states as diverse as Wyoming, Florida, Texas and California. 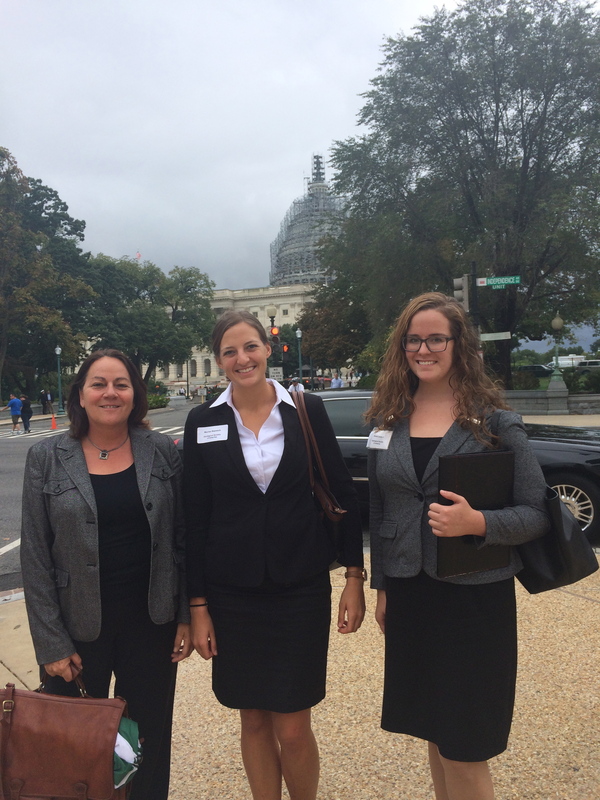 GSA, along with many fellow geoscience societies, organized the 8th Annual Geoscience Congressional Visits Day, or “GeoCVD,” which took place from September 29 to 30. The Capitol Building photobombs GeoCVD participants on the Hill. Credit: Kasey White. Established and emerging geoscientists from academia, industry, and government attended a workshop and reception on the 29th to welcome and prepare them to make the most of their visit. The following day they met with their Representatives, Senators, their staffers and Congressional committees in small teams to talk about how strong federal investment in geoscience research and education can enhance national security, support resilient communities, sustain a highly skilled workforce and strengthen the nation’s global and economic competitiveness. Organizers from the many hosting geoscience societies gave participants a refresher on how Congress works during the orientation, focusing on the current status of federal geoscience funding. Kasey White, GSA’s Director for Geoscience Policy, spoke about H.R.1806, the “America COMPETES Reauthorization Act of 2015,” and its stipulations to cut NSF funding for geosciences, despite increasing overall funding for NSF. White also detailed cuts to many geoscience research programs at the Department of Energy contained in the bill. The House passed the bill back in May 2015. The Senate has been holding roundtables and seeking feedback before releasing a draft bill. White also discussed the “NASA Authorization Act of 2016 and 2017 (H.R.2039),” which includes deep authorization cuts to NASA’s Earth Science Division and cuts to geoscience research in the House appropriations bills. Participants heard from current geoscience congressional fellows, including GSA-USGS Congressional Science Fellow Susanna Blair. Congressional Science Fellows work for a year as staff members for Members of Congress or congressional committees. The fellows shared their experiences and lessons learned about effective meetings from their time on the Hill with the participants. Once participants were up to speed on the latest science policy legislation, they had the opportunity to practice their message with fellow team members. Each team had between two to five people and was matched with Congressional offices from a state or pair of states, as well as Congressional committees. Teams came up with strategies to find local, resonating messages to bring to Congress highlighting geoscience research. For instance, Annika Deurlington, an undergraduate student at Claremont College who was awarded travel funding by the Cordilleran section, told Tom McClintock’s (R-CA) office that she appreciated his dedication to finding ways to store water and also asked him “to promote groundwater storage wherever possible,” Deurlington said in an email. Participants ended their first day on Capitol Hill at a reception hosted by the USGS Coalition, of which GSA and other societies are members. Over 150 people attended the event, which honored two members for “their efforts to advance the scientific fields that further our understanding of Earth’s living and non-living systems,” Robert Gropp, the chairman of the USGS Coalition and Interim Co-Executive Director of the American Institute of Biological Sciences, said in a statement. 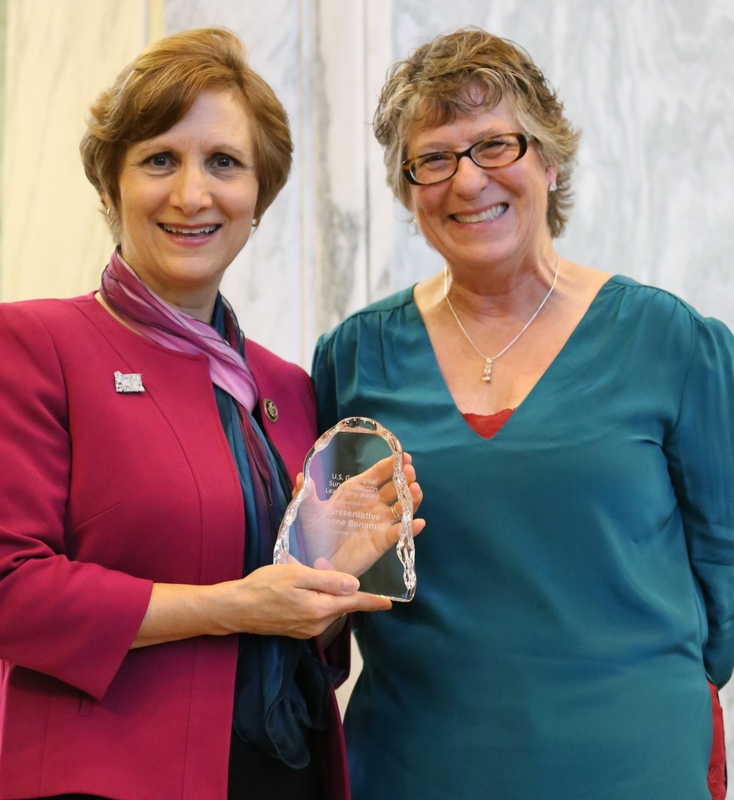 GSA Executive Director Vicki McConnell presented Representative Suzanne Bonamici (D-OR) with the USGS Coalition Leadership Award and said that Bonamici “really gets it” when it comes to the importance of federally funding geoscience. McConnell commended Bonamici for her work on H.R.34, the “Tsunami Warning, Education, and Research Act of 2015,” which authorizes and strengthens tsunami detection, forecast, warning, research and mitigation program. In her thanks, Bonamici said that she is on geoscientists’ side and will continue to be an advocate for funding scientific research. Elizabeth Duffy, the Government Relations Director for the Seismological Society of America, then honored Representative Tom Cole (R-OK) for his support of geoscience research and his wise management of natural resources. Cole expressed his thanks and said that he is “not used to getting these kinds of accolades,” but supports up-and-coming science. David Applegate, the Acting Deputy Director of the USGS, echoed the speakers’ gratitude for the Representatives’ support during his speech at the reception. Participants were clear in their message on the importance of sustained funding for geoscience and enthusiastic when sharing their research with policy makers. They began their next day back on Capitol Hill meeting with their members. “My hope is that I was a tangible reminder to congressional staffers that money spent on education and research translates into professionals who can perform tasks that benefit society,” Deurlington said. Jon Price, GSA’s current president, connected with his local, Nevada Representative’s office. The office returned Price’s interest and will be sending a staffer to an open house of the Nevada Bureau of Mines and Geology in late October to learn about geological hazards and mineral and energy resources. 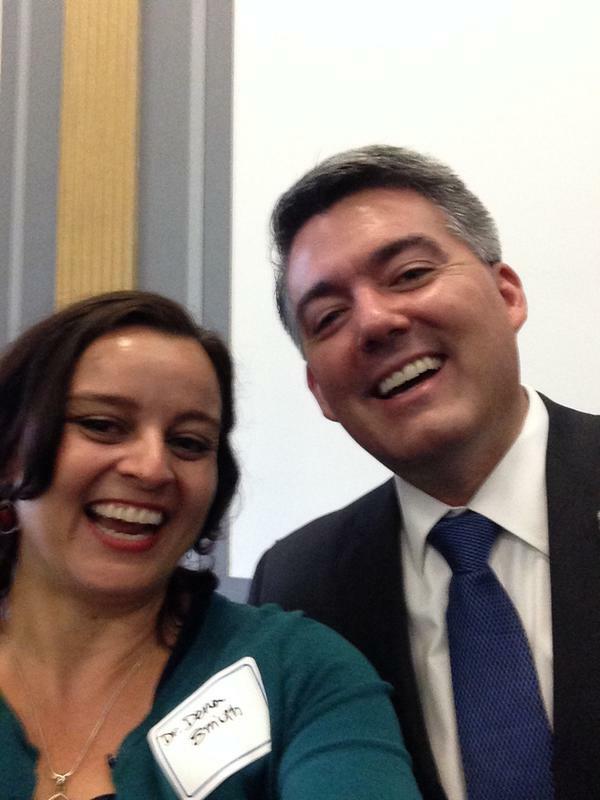 Dena Smith, the Executive Director of the STEPPE program at GSA, takes a selfie with Senator Cory Gardner (R-CO) during GeoCVD. Marisa Repasch, a graduate student at the University of New Mexico who received travel support from GSA’s Rocky Mountain section, visited Representative Michelle Lujan Grisham’s (D-NM) office. Along with her team members, Repasch closely connected with Grisham’s office and discovered that Grisham is interested in New Mexico’s geoscience research, especially the environmental impacts of the Gold King Mine spill into the Animas River, which flows through New Mexico. “Geology is a significant part of New Mexico’s economy, culture, and health, and it is impossible to have a functioning society without geoscientists,” Repasch said in an email. “I am excited about all the new connections that were created between congress and their geoscientist constituents. I am sure that our actions on Capitol Hill will have a positive impact on the federal funding appropriated for geoscience research,” she continued. Next Next post: Cold War Tree Rings: Do trees archive uranium?